Church planting has a certain wandering component. A small band of travelers has a sense that they are going somewhere, being led somewhere, but doesn’t exactly know where they are going, yet feels nonetheless, called. If there were no sense of needing to go somewhere then why would you have ever planted a new seed? As the seed takes root, it spreads in all sorts of unexpected ways trying to find good dirt, good water, a good habitat. Not all of this planned. Last weekend our family was swimming at Jordan Lake next to a Loblolly Pine that grew tall along the sandy beach, yet virtually all of its’ roots were exposed above three feet of washed out sand in a web that looked like it had none of the components to sustain life. And yet, there 30 feet above the ground, was the top of a thriving pine. Everyday in life we feel called in different directions, eating new foods, having new conversations, writing about new dreams from our sleep. We make some plans. Have our confident visions as to just how each plan will unfold. But as we travel the path it turns out to be curvier and hillier than the ping pong table of steady progress. David Whyte describes the term pilgrim as “a word that accurately describes the average human being; someone on their way somewhere else, but someone never quite knowing whether the destination or the path stands first in importance” (Consolations, p.165, 2014). Our faith tradition has boldly proclaimed Jesus as The Way, so we have some latitude when describing our project as a journey rather than destination. How are you living out there on the way? The Tobacco Trail Church is an actual path in North Carolina with a bunch of pilgrims typically traveling on foot and on bike. 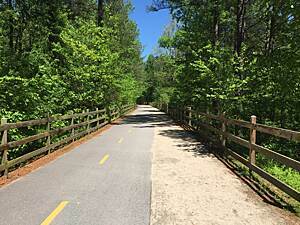 You can find this way in Southern Durham and by traveling South into Chatham and Wake counties. George Linney is thankful to serve as founding pastor.